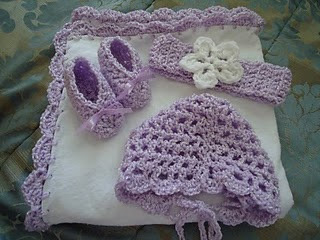 I learned to crochet from my grandma when I was in grade school. She taught me the granny square and basic stitches. Over the years I taught myself to read patterns and learned more challenging stitches. I tried to teach all my girls the craft, but only two of my five daughters picked it up. 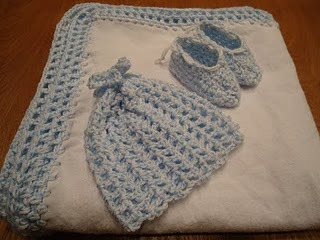 My second oldest has a lot of friends who are expecting and she has been crocheting the sweetest baby layettes. Here are a couple photos and the link to her blog.